According to reports on Twitter, Reddit and MacRumors forums, Amazon's Visa Rewards card is now compatible with Apple Pay. Amazon reportedly enabled the feature today, moving quickly to bring the mobile payments service to consumers who were disappointed in Amazon for not supporting Apple Pay at launch. 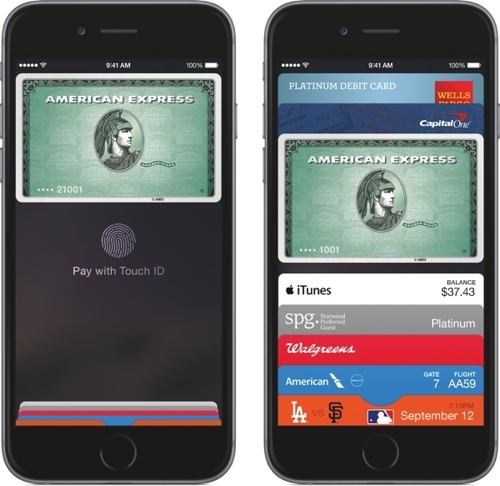 Apple Pay launched on Monday with support from a large number of credit card companies and banks. Among the launch partners were Chase, which is the issuing bank for the Amazon Visa Rewards card. Amazon reportedly was the only Chase consumer card not supporting Apple Pay, sparking rumors that the retailer was deliberately rebuffing Apple's mobile payment efforts for competitive reasons. Hey, Amazon Chase Visa cards now work with Apple Pay, complete with Amazon logo on the card and all. That was fast. Amazon dispelled these rumors by confirming it would enable Apple Pay soon, but few expected the rollout to happen so quickly. Customers with an Amazon Visa Rewards card should be able to add the credit card to Apple Pay with full support for mobile payments. Thanks, Apple and Amazon, for playing nicely on this. Now, could you two sit down and bring Amazon Prime Movies/TV to the appleTV? How funny is it that my Barclaycard (Apples credit card partner for purchases) isnt yet supported?! Oh yeah, wait, its not at all comical! Great, now if PNC could get in line my life would be complete. The interest rate of so high on the Barclay Card (over 20%!) that I will never use it after I finish paying off my MacBook (with 0% interest) in the next couple of months. Maybe the interest rate will go down after I pay off the interest free balance, but if not it will gather dust in a drawer or I will cancel it. WOW ... don't set life's bar so high! Are people really getting upset at a service / provider or vendor if they don't support Apple Pay? Are we really such 'consumers' that it's a big deal? I agree Apple Pay is convenient, but really... 1st world problems. While I haven't gone so far as to boycott any businesses, I will say that once you've been hit with identity theft (one or more times), a payment method that protects your information becomes more and more important. Twice a victim, once for thousands and once that almost got me arrested, and currently waiting for the second replacement card this year due to Home Depot breach. Now, that is a company with customers' satisfaction as a priority. No wonder they are so successful. Not really sure I'd call them successful. They lost about half a billion dollard last quarter. lol. I think you'll find people here aren't really representative of the general public. Or at least that's my hope. * Supposedly all Chase Visa cards worked with Apple Pay. Instead, it turned out that all Chase Visa cards worked EXCEPT the Chase Amazon Visa Rewards card. * The impression was that Amazon was holding out for some political Amazon vs. Apple nonsense. * The Chase Amazon card is what I use for 90%+ of my purchases. Yes, I get that Apple Pay is new. Yes, I get that I could still use my physical credit card. None of those are the point. The concern was that if this was going to be an Amazon vs. Apple issue, then the consumer loses. I feel that I should be able to use my credit cards in the way that I want to use them. If this was an Amazon/Apple fight, then Amazon would be dictating how I can use my card, which, personally, I don't like. Glad to see that this got worked out so quickly. I suspect the public outpouring and attention is what got this resolved. BTW - I got to use Apple Pay the other day, and it works great. Super easy. Very smart. This will be a winner. You've been hit for identity theft and it almost got you arrested? While I believe you, I would like details, as I know how dumb and oblivious law enforcement is. People who know me are sick of this story, but here goes. I mentioned the one time that took me for a ton of money (which I did eventually get back). Never found out exactly how it happened, but it is assumed it was a skimmer on a card machine. The second one was a lot more complicated. Somehow, someone got enough of my information to impersonate me. They changed my address for my driver's license and had it registered in another city, and started diverting some of my mail to this new address. Then they used my identity to open up a phony business, promising to help people clean up their credit scores. People being stupid, they fell for it by the thousands. Because mail fraud was involved, the US Postal Inspectors got involved, as well as the Secret Service. Meanwhile, I'm cruising around none the wiser, since there were no fraudulent charges on my cards - the person who devised this was smart enough to not try and use my credit cards. That's one reason it took so long for her to be caught. So, one day I'm driving to work, doing the speed limit, and I get pulled over. Turns out my plate was expired, which I didn't even realize because I never got the notice in the mail (because my address had been changed without my knowledge) and it just slipped my mind. When the officer looked up my driver's license, he saw a completely different address and photo on his computer than what was on my license, and had to make a decision to either arrest me for driving on a bad license and with expired plates, or to believe my story that I had never lived in this other city, was NOT a black woman (which he could see) and this was my legitimate license. He was cool about it and just warned me not to drive anywhere until I got it cleared up. So, I had to leave my car in a parking lot, get someone to come get me, do all kinds of police reports and affidavits as to who I was (proved with my passport, thank goodness) and get my license reinstated. I can no longer renew license or plate online, I have to go in person, with passport. Which reminds me... I need to do that in the next couple of weeks. Thousands of people were caught in this scam, and they are still building a case against the person and her accomplices. And by the way, turned out she also used my identity to commit tax fraud too. Unfortunately for her, I owed money for the last two years, so she didn't get anything there from me, but she did steal lots more from the IRS in other names. So, long story short, although it is probably too late for that, I fully and completely support Apple Pay.